So I have had a little extra time this morning for cooking since I am home with a sick child. I’ve been making apple pies all morning and I am realizing that cooking makes me generous. As soon as I start chopping, my heart begins to just pour out of me into whatever I’m making. This feeling that I get where I wish the whole world could have a bite of a perfect apple pie on this cloudy October day is much of the reason I love to cook. For the last six months or so, a group of teenage boys have been showing up at our house on Sunday evenings to meet with Taido. And while my darling husband and his theology speak is enough of a draw all his own, I suspect that the real reason they keep showing up is that we feed them. Come on. They’re high school boys. A few weeks ago in the wee hours of a Sunday morning, I was putting a chicken pot pie together for dinner, so that I could enjoy my lazy Sunday afternoon at my parents’ house. Sprawling on my parents’ couches while my kids play legos with their cousins is not a tradition I’m willing to give up even for cooking. While I was rolling out crust and chopping up vegetables, I was praying for each of these boys by name and I got a little teary…as much from the onions as the ache in my heart from watching boys grow into men. Boys that my own boys now love dearly. Boys that are goofy and loud and heartbreakingly precious all at the same time. I realized once again while I was working with my hands and heart together that my love language is food. Sometimes food connects me to people I don’t even know yet. Cole is only still speaking to me because he likes to eat. He’s been asking for extra dessert in his lunch for his friends. Sending whole loaves of banana nut bread in his lunch is helping him engage in a battle for control I like to call Just Try and Make Me Ride the Bus. He’s buying rides home with homemade cookies. I’m hoping that when he looks back on the seventh grade, maybe he’ll remember the food in his lunch instead of the heated discussions over grades. 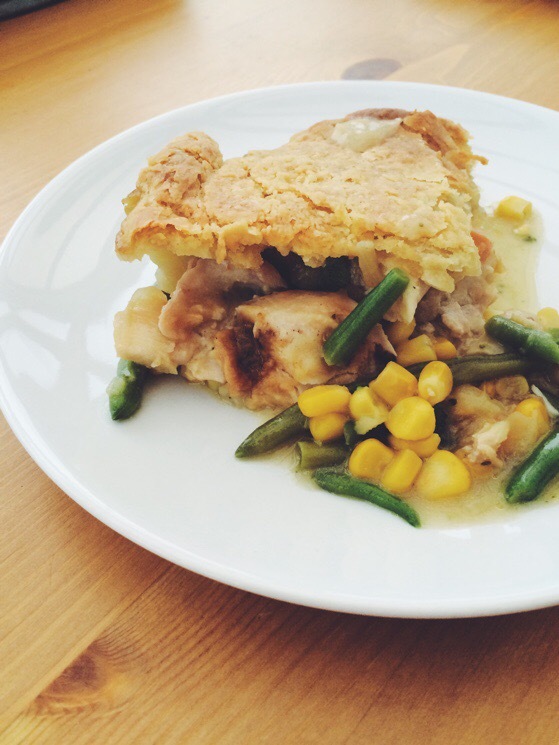 If there are some people in your life you want to love with some food, here’s my variation of my mama’s delicious homemade chicken pot pie. 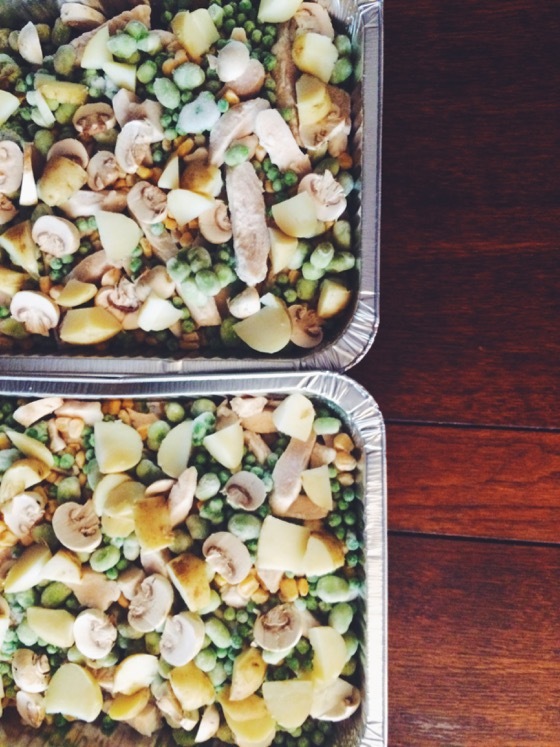 Tonight I’m making Arroz Con Pollo from my favorite food blogger. And apple pie, of course. Oh, and here’s a link to the latest Castle Bluff Camp video featuring the most excellent photography of my amazing sis-in-law. It makes me cry every time I watch it. LOVE THESE KIDS!! This recipe is “supersized.” I make it in a cake pan the size of a large cookie sheet, but you could divide it into two 9X13 pans, or half the recipe. Also, I use less chicken and more vegetables, which is why the measurements vary. You can even use vegetable broth and make it vegetarian. Melt butter in large skillet. Cook onions in butter about five minutes. Add celery and carrots. Cook 5-10 more minutes. Stir in flour. Add salt and pepper. Slowly add broth and milk. Cook until thick. Bake at 400 degrees for about an hour or until crust browns. Mix flour and salt. Cut in the butter with a pastry blender. Drizzle water while stirring and form into a large disk. Cover in plastic and refrigerate until ready to roll out. PS. This pie is SUPER EASY to make in bulk. 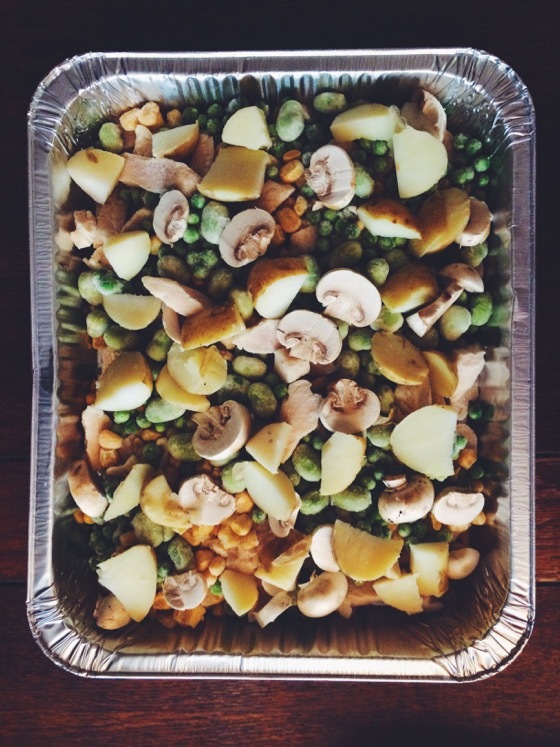 So if you have a deep freeze, you can buy a big stack of those foil pans and freeze several of these for later! Double the cooking time when cooking from frozen. You seem like an amazing mother and wife. Your family is blessed. I write a blog about how men can be great. How they can love their wives completely and show them everyday. I hope you and your husband will check it out but even more, I wish the young men in your home and all over the world would read and start to love their wives as Jesus loves. yes, you do love us all with that amazing food – and I am so glad that you do! so fun to read how you love those high school boys – and so sad michael will miss out tonight — flu, or something like it, has him down today. boo that michael has the flu! he was sorely missed! you can come by and eat his helping tomorrow…plenty left!